This entry was posted in Culture, Food, Japan, Travel and tagged Alcohol, Cultural differences, food, Food and drinks, Hotel, Impressions of daily life, Japanese culture, Ryokan, Traditional Japan, Travel by Haruko-chan. Bookmark the permalink. Actually, my very Western, kind of Southern US family considers rice porridge a traditional breakfast food. But miso and pickled vegetables sound too salty for first thing in the morning. Would that be sweet rice porridge? We eat that in Belgium too. But Japanese rice porridge is salty, with a pickled salty plum in the middle. Yes, it’s sweet and mushy. Congratulations on a very simple easy to read blog Haruko-chan with great information on Japan. I was wondering if I could use some of your content on my website http://www.japansnowaccommodation.com?? I would provide a link back to your blog of course. As long as you credit me as the author and link back to my blog, you are welcome to use my content. A vote for in-between: I liked traditional Japanese breakfasts when I had them, but I liked the other meals even better! Ahh, I remember my first Japanese breakfast. Even after they told me the pickled plum was sour I still plopped the whole thing in my mouth expecting something sweet. People were in tears (laughing) as I struggled NOT to spit it out. Lesson learned: if you’re not sure what it tastes like drop your expectations and then NIBBLE at it. With that said, I’ve had some great Japanese breakfasts. The quality at most hotels or B&B’s I stayed at sent me to flavor country. I agree about the quality at hotels and B&B’s! 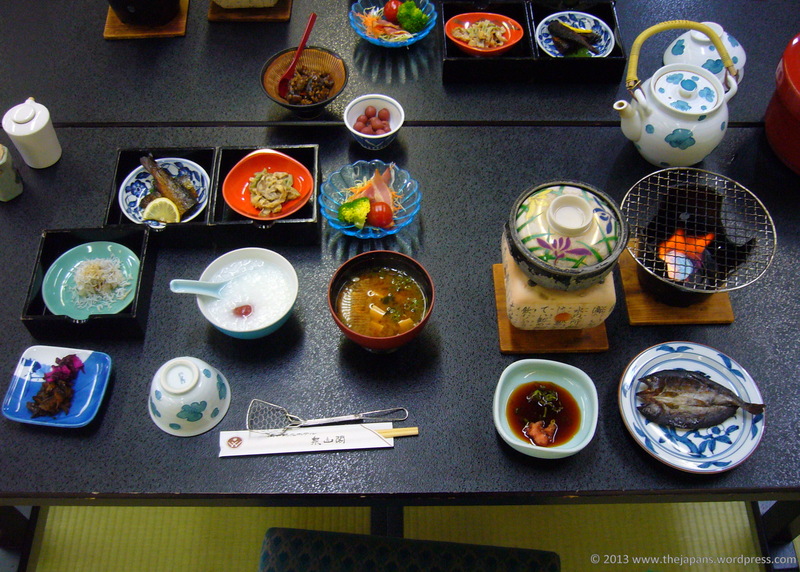 The quality of food in Japan is great in general, not just for breakfast but for all meals. If you want a decent meal at a decent price, Japan is the place to be! Thanks for the explanation of the dishes. 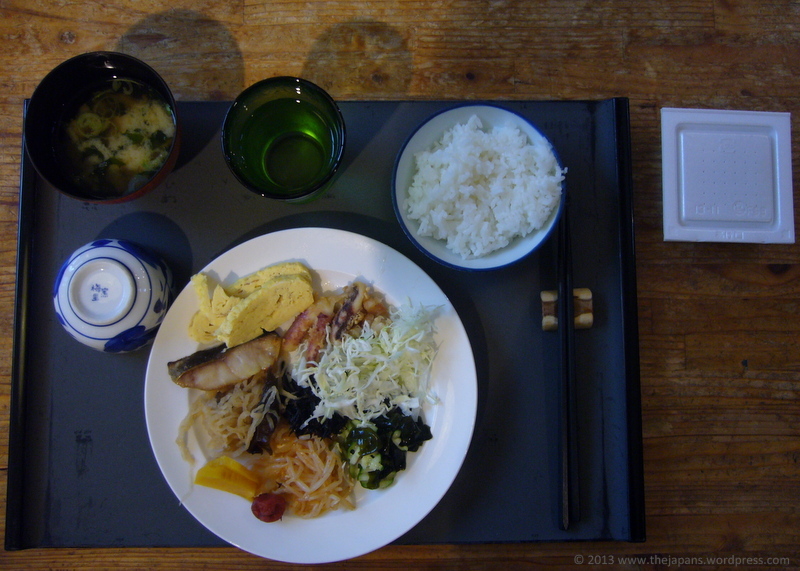 And I agree with you about a ryokan brekkie – it’s huge! 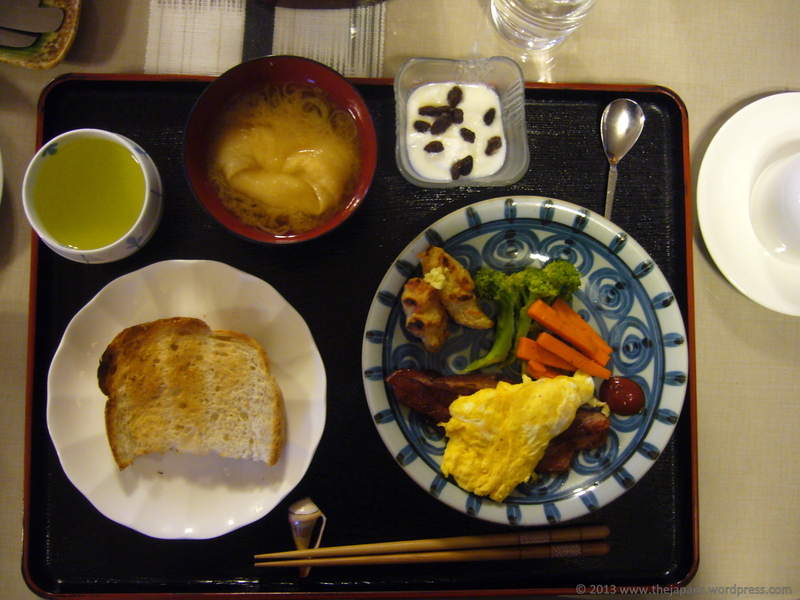 I adore the Japanese breakfast. I wish someone would get up every morning and make for me. As it is, I fix my little bowl of cereal and blueberries. Thank you for following my blog. This is so interesting! I have often wondered about what breakfasts are like in other countries but never looked into it. It seems that there are not really “breakfast foods” in Japan like pancakes, cereal, or waffles in Western countries. I would love to have miso soup and rice in the morning! I think many people respond to this post because having breakfast is something that people all over the world can relate to. I’m not sure where you are located (US maybe?) but it might interest you to know that in Belgium, pancakes and waffles are not really breakfast foods. We eat them between 2 and 4 p.m., a bit like an afternoon break, optionally with a cup of coffee. I guess the most typical breakfast food over here would be the small breads we call ‘pistolets’ (http://tinyurl.com/bhopra9) and the sweets we call ‘koffiekoeken’ (http://tinyurl.com/ax7smbd). They are usually only eaten on Sunday. When they ask Japanese or Western breakfast, I respond in record time with a resound “WESTERN”. The smell of fish in the morning is too much to topple. Thanks! The beer thing seems te generate a lot of (varied) responses from people all over the world. Cultural differences are so interesting! While visiting Germany I noticed breakfast beer at restaurants to be a theme. I was happy for it and joined in with the locals. Especially since where I live the thought of a beer before noon is shocking unless it’s to nurse a hangover but it is frowned upon. As for breakfast I am Mexican so having rice, soup, beans or meat in the morning is something I am accustomed to. My hubs and I are are a bigger fan of breakfast for dinner: omelettes, pancakes, or scrambled eggs. What was it about the fish that you had problems with? The flavor or because the head was still attached? The main problem with the fish was that it upset my stomach a little. I did not have a problem with the fish head, in fact I often eat fish that is served that way. Actually it was the other piece of fish (the one with the lemon slice in the left upper corner) that gave me most of the trouble. It is a kind of fish that is eaten with the intestines still inside. So you are supposed to eat the intestines too, which tastes very bitter. Even at dinner time I am not a fan of this kind of fish, although I can eat it if I have too. But in the morning it was too much for my poor stomach. The rest of the meal was delicious though. The attitude towards beer before noon is the same in Belgium. It is frowned upon by most people. It took a couple of days to get into the swing of the whole ‘fish for breakfast’ routine…but man were those meals good!! I never thought I’d see the day where I missed having fish for breakfast, but on our first day back in Australia that’s exactly how I felt! oh…and natto is nasty. 🙂 Nasty natto!! On the other hand, it is nice to discover that apparently there are many other gaijin who love Japanese breakfasts as well. Maybe it was just a coincidence that I ran into a fair few who didn’t like it. My score was 2-0 as well! The first time I tried it I didn’t realise you were supposed to mix it with soy sauce and rice. I tried to eat it raw…not a good idea and so messy! Second time around was better, but barely. I also heard of people who mix it with soy sauce and mustard and then eat it from the container (so without rice). They stir it pretty well, making it more sticky, untill you clearly see a lot of white threads around the natto. That way it is considered more delicous, although the increased stickyness only made it worse for me personally. My Japanese teacher in Japan told me that her breakfast every morning consists of a bowl of natto with a raw egg and negi, all mixed together. During her busy morning as a mom, she just shovels that down. Healthy and quick, she said. I’m sure she’s right, but it didn’t sound very appealing to me. But as a westerner I find the best way to eat it is on toast. Natto toast makes a great breakfast, you can add any other spices to the natto before whipping it into a slime – pepper, turmeric, chili etc. Sesame seeds are also great. 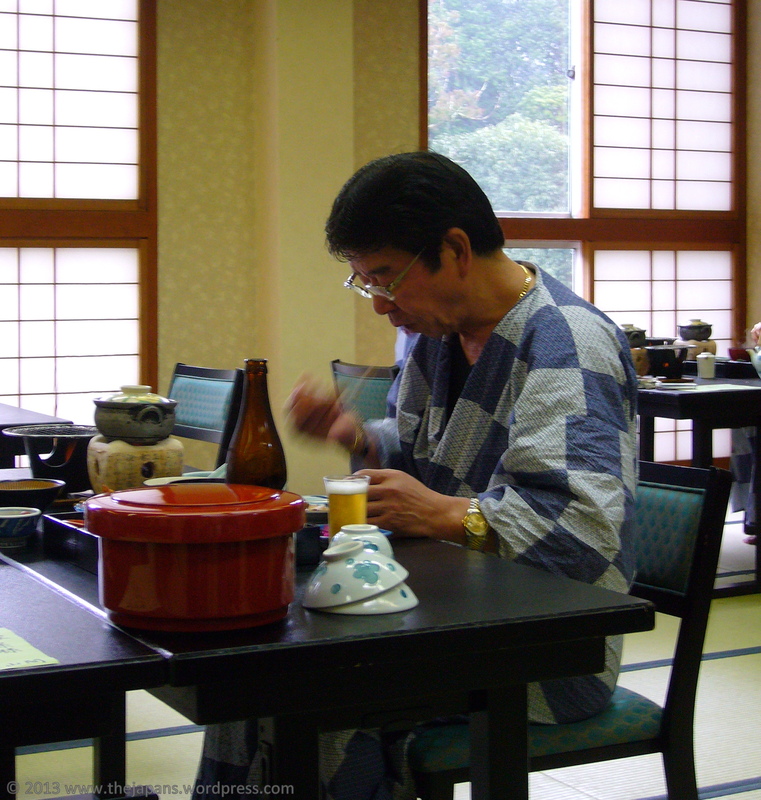 There’s a cool book available – “365 Natto” – a recipe a day for the year! It’s hard to imagine anyone would love natto so much they’d want to eat it every day ^_^ Just kidding of course, I actually know a Japanese girl whose favourite food is natto. Heheheh, beer for breakfasT~ Excellent. Yeah I’ll admit that Japanese breakfasts are a little bit heavy for me. BUt I can definitely see the health side in them – breakfast is the most important meal of the day, so I suppose it should be a little on the heavy side. My girlfriend’s attitude to cereal (especially muesli) for breakfast is to dismiss it as bird food! The breakfast looks great! And most of it being home grown, it must be extra yummy. Other than that, what an idyllic day you describe in that post! The images of the cherry blossom and the quiet contentment of the people in the Japanese countryside really made me miss Japan. Yes, we like beer in the morning but only when travelling. I do it at airports or on the bullet train. But these days I normally substitute beer with Champagne or some sort of sparkling wine. Thank you for enlightening me (as usual ^_^). I didn’t now that the alcohol thing is only when travelling. Admittedly, these days in Belgium a champagne brunch is becoming more and more popular. 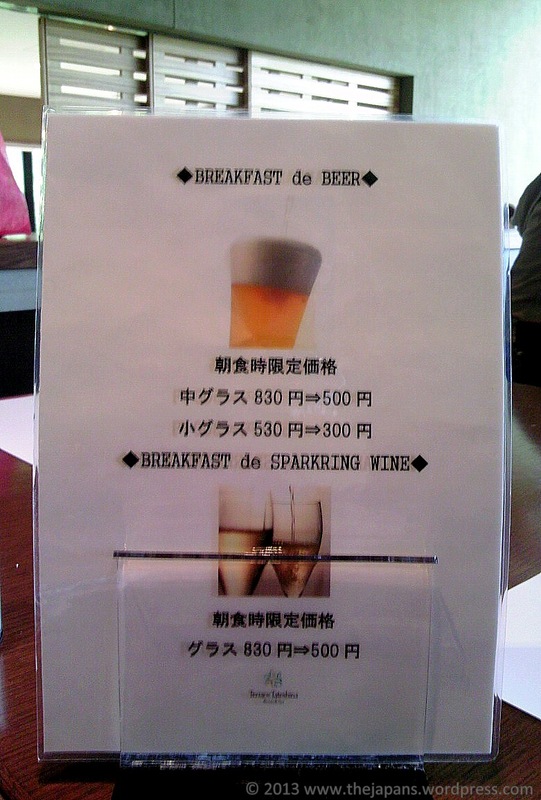 But beer with breakfast still feels a bit strange to me. A bit ironic for someone from a beer drinking nation like Belgium, right? I do wonder what most Japanese have for breakfast at home these days. Do you have any idea about that? Have many people switched to, for example, toast and coffee or is rice and miso soup still a common breakfast in most Japanese homes? I do wonder that, too. I am always surprised at what things I take for granted but which apparently may not be normal. 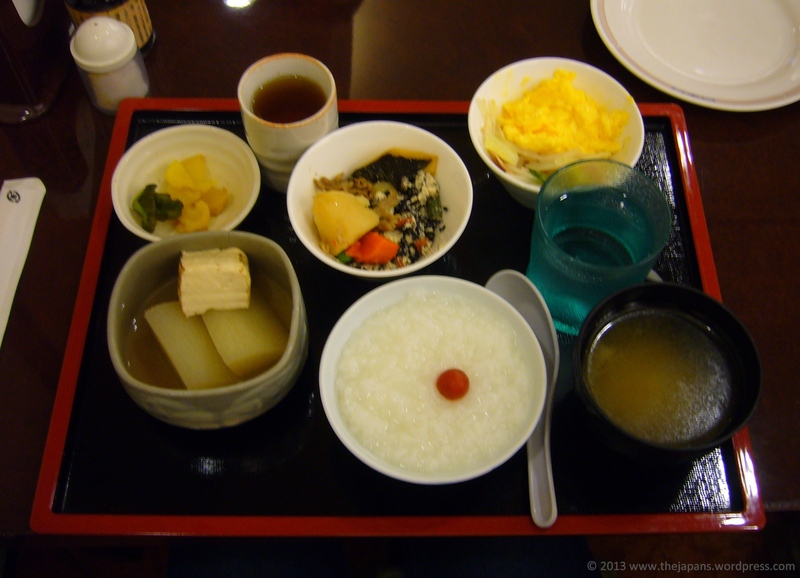 That said, I think many people eat traditional Japanese breakfast of rice and miso soup, and fish I’m not sure. In Tokyo, it could be more common to see bread and coffee kind of breakfast. But one thing I find different is people who believe they are having the western type of breakfast often have a salad in the morning which to me is not the norm as typical “western” breakfast. For us, there is a general tendency to believe what we do not do at home, we can do away from home or on special occasions, travelling being very much one of those circumstances. And the seating arrangement is a factor, too. If we were sitting with our back to the window, we would never drink regardless of the time of the day. It’s when we are in the bullet train kind of seating situation, we are so much more inclined to drink though maybe not on commuter trains with the same seating arrangement. Do you follow? I meant to say that it’s the seating arrangement “on the train”, that is a contributing factor. Haha, I didn’t know that about the salad. Indeed Western breakfast never includes salad. About the Belgian beer habits: it is true that in Belgium there are also people who have beer early in the day. But I have the impression that over here, people who have a beer before noon are often viewed as having an alcohol problem Generally it is frowned upon. But the strong beer with cheese at around 4 p.m., on the other hand, is totally normal. And the image of the old ladies indulging in such a thing is indeed very typical. I had never stopped to think how that might seem strange to foreigners ^_^ Interesting! Haha, I agree, oishikunai! The natto in the picture is one of only two occassions where I attempted to tackle the biggest Japanese food hurdle know to Western man. I was trying to be as Japanese as possible, and I am not one to back away from a challenge, but natto proved too much for me. It is one of the few Japanese foods that I really don’t like. I can relate ^_^ You know, most foreigners lose weight when they move to Japan, due to the healthy Japanese food. But I actually gained weight! I blame it on the delicious Japanese cuisine. Just can’t get enough of it. Just browsing through your photos made me crave for a big Japanese meal!! I wish I was back in Japan now and eating authentic Japanese dish. Yes, apart from the fish, which tasted very bitter due to the fact that the intestines are also eaten, the quantity was the biggest problem. Most of the meal was indeed delicious! Great photos. I wish I were eating this for breakfast today.